The weather’s warming. The weekend’s approaching. Somewhere, on a sun-warmed patio not too far away, someone is pouring a mimosa. That’s your signal, brunch heroes: time to whip out your spatula, don your apron, and give your friends and family the brunch they deserve. You’ve got the basics at the ready: the fresh fruit, the coffee, the orange juice and bubbly, even those little butter packets you got who-knows-where and keep in a drawer for special occasions. Only one question remains: What will be the star of the show? Sure, you could stick to the classics, but you’re a brunch hero, not the mild-mannered oatmeal-stirrer you pose as on weekday mornings. If you’re low on inspiration, don’t let that deflate your cape; every Batman needs an Alfred. So allow us at ChefSteps to play your trusty butler-slash-confidante. (Oh, and we wouldn’t mind tending your gadget-filled lair either.) Whether you prefer syrup-drenched pancakes, crispy hash browns or buttery croissants, we’ve got a leveled-up version that’ll help you save the city—or at least Saturday morning. Got a sweet tooth? Try our puffy, vanilla-scented Dutch Baby Pancake. Though it looks impressive, with its sugar-capped mountains of dough, it’s surprisingly easy to make. You can even whip up the batter the night before, then pour it in a cast iron skillet and puff it up in the oven the next morning. Sprinkle with powdered sugar, spritz with lemon juice, drizzle with maple syrup, and serve to your delighted guests. You’re more of a savory type. To you, it’s not brunch without eggs, hash browns, and two slices of bacon. Allow us to suggest our golden-brown Pomme Rösti. Inspired by the traditional Swiss dish, this potato pancake starts with buttery shreds of starchy goodness that we sauté, then bake in the oven for out-of-this-world crispiness. Finish off your rösti with your favorite sides and toppings: sour cream, fresh herbs, smoked salmon or—of course—bacon and eggs. You run with a globe-trotting crowd and have the tastes to match. 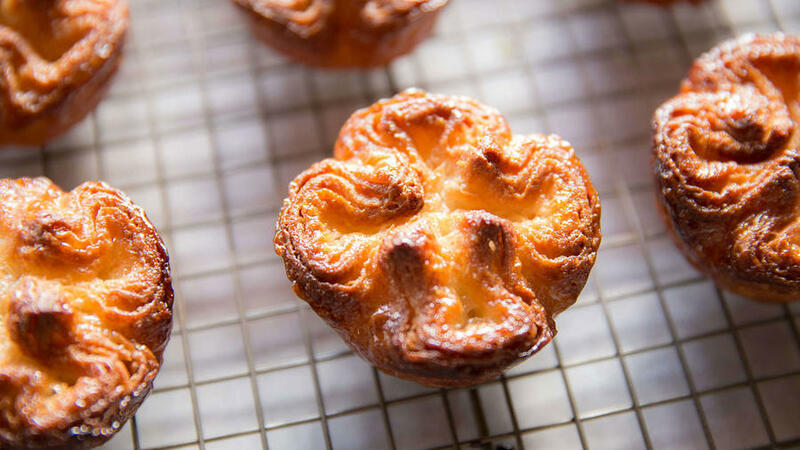 You can’t fly to France and bring back an authentic boulangerie-pâtisserie, perfectly coiffed pastry chef and all, but you can entice your brunch guests with a basket of kouign amann, fresh from your own oven. Making these crusty Breton pastries is a labor of love, but it’s well worth it. Start with croissant dough, cut it into individual portions, and shape them into gorgeous cakes with salt-dusted caramelized tops and buttery, flaky insides. Your friends aren’t easy to impress, but these intricate pastries just might do it. ChefSteps is a team of award-winning chefs, filmmakers, scientists, designers, and engineers focused on revolutionizing the way people cook by inspiring creativity and encouraging expertise in the kitchen. Learn more at ChefSteps.com.